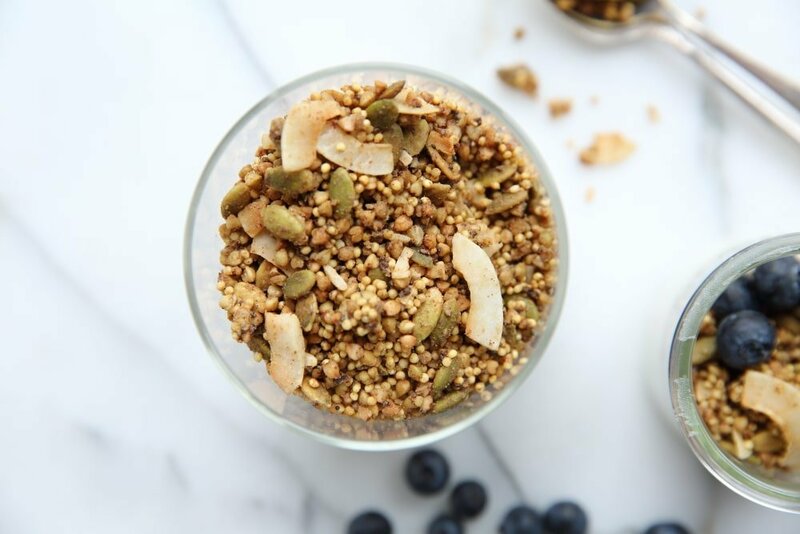 This buckwheat and millet granola is a nutritional powerhouse, made with chia seeds, pumpkin seeds, nut butter and coconut oil. I love millet and buckwheat, both of which I always have on hand for breakfast bowls and grain bowls (you can learn all about the grains and find delicious was to use them in my book, Build-a-Bowl!). Millet and buckwheat are actually not part of the grass family, meaning they are not technically grains but rather seeds. They’re naturally gluten-free and easily digestible. 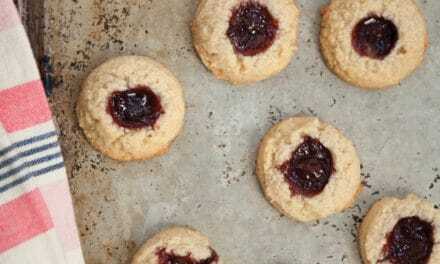 I developed this recipe after discovering that I have a slight allergy to oats. While I can handle them in moderate quantities, they have a tendency to give me headaches if overeaten (weird but true!). I therefore started experimenting with different grains, and after trying a millet granola on a fruit salad at a posh NYC restaurant, I knew I had my answer. Why not pair millet with buckwheat, which I often toast up with maple syrup to make these maple buckwheat clusters?! The beauty of this recipe is that the millet and buckwheat don’t even need to be cooked before baking. Once toasted, they turn crispy and nutty and absolutely delicious. 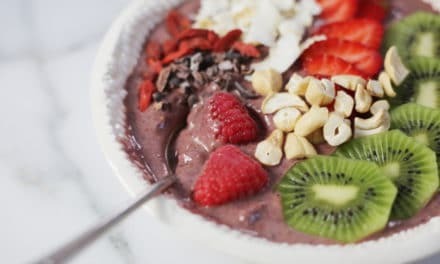 I love this granola over yogurt, on smoothie bowls, with milk (sometimes I add chopped dark chocolate, but don’t tell my kids! 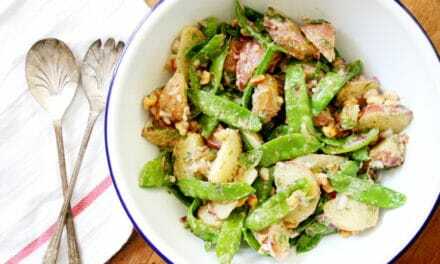 ), or even sprinkled on salads or pureed squash soups for a bit of sweet crunch. While I often sweeten this granola with honey, you can also use stevia to make it completely sugar free. Stevia is a natural sugar-free sweetener extracted from leaves. It’s 100 times sweeter than regular sugar, so a little goes a long way (I’ve found that the more you eat it, the more acclimated you become to its flavor, which can take some getting used to). You can find it pretty much anywhere these days, either in powdered form, which you’d need here, or as a liquid. This granola is just the clean start I need to start the day. Plus, it has plenty of protein to keep me fueled until lunch. 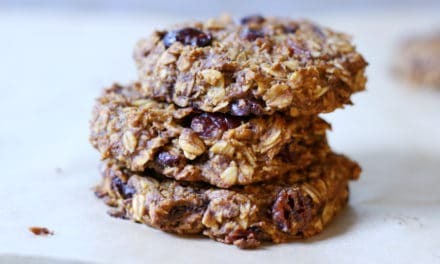 For a more traditional approach to granola, try this coconut flax granola or these crunchy granola clusters! You can find millet and buckwheat in the bulk food or grains aisle of your grocery store (Bob’s Red Mill is a trustworthy brand). Be sure to buy regular buckwheat groats, not kasha, which is roasted. Rinse the grains in a strainer and drain them well before using. This will remove any impurities on the surface of the grains, but more importantly, the moisture will help the granola to clump slightly. The type of nut butter you use will affect the flavor, so go with what you like—I usually opt for almond butter or sunflower seed butter, but it’s up to you. You can either use honey or stevia to sweeten the granola. If using honey, the granola will brown a bit more due to the caramelization of the sugars. If using stevia, start with 1/2 teaspoon and taste before adding more (different brands vary in their intensity). Use any leftover stevia to sweeten breakfast porridge, smoothies or coffee and tea. 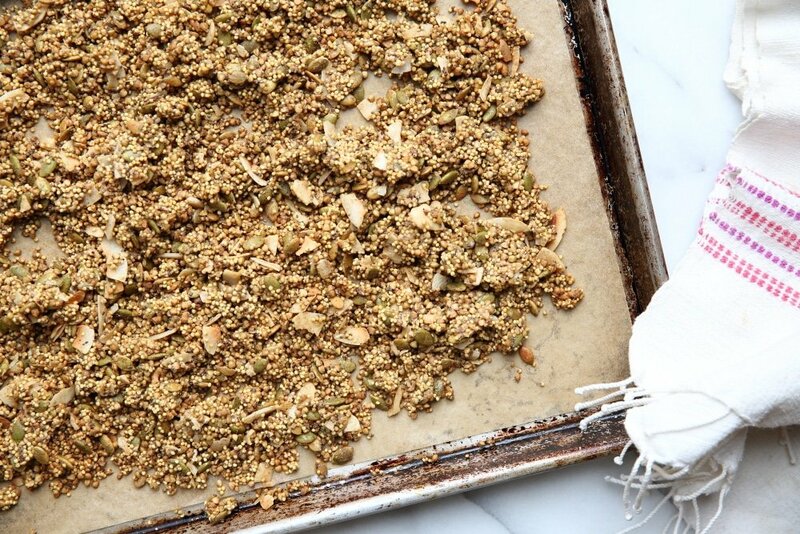 Bake the granola on a parchment lined baking sheet. I couldn’t survive without these pre-cut parchment sheets and my rimmed baking sheets. 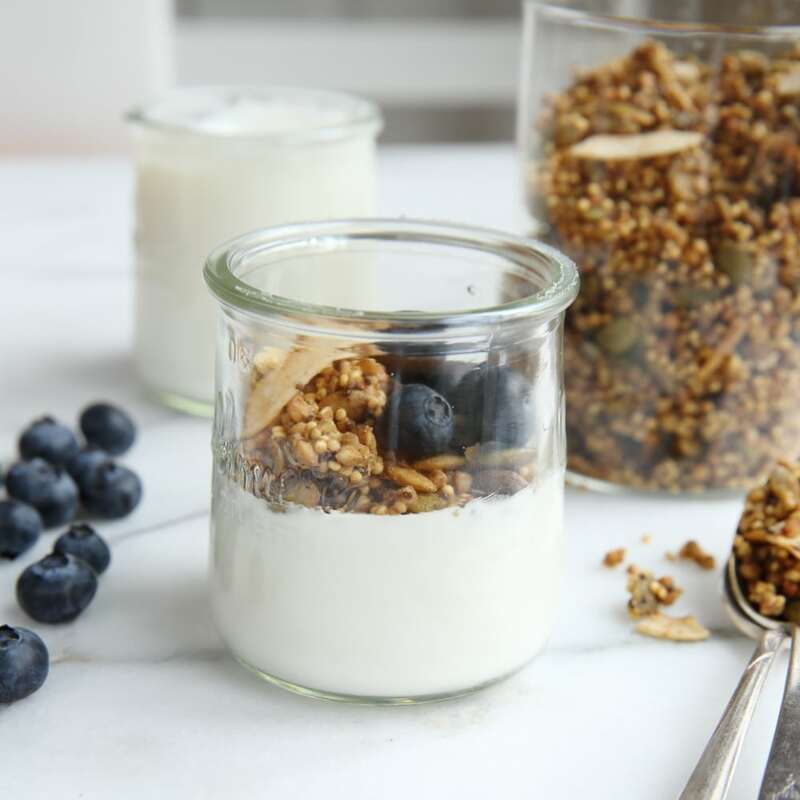 Store the granola at room temperature in an airtight container. I love these wide-mouthed glass jars. 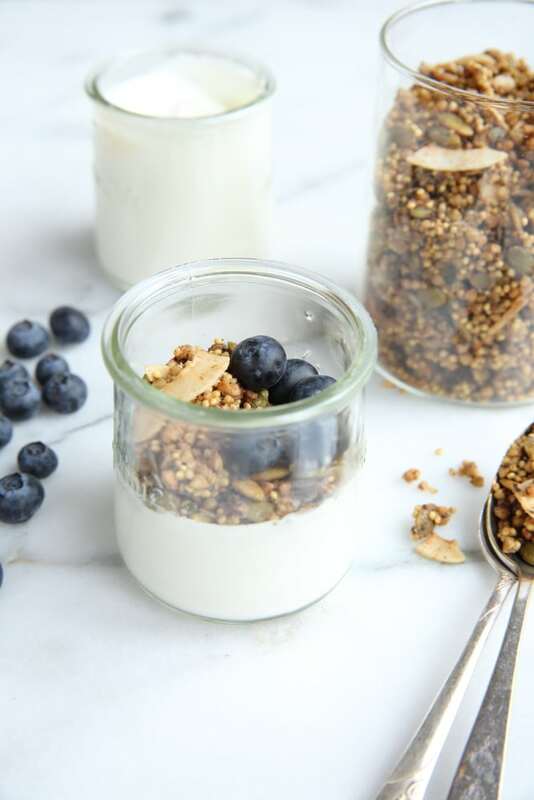 You can serve the granola on its own with milk or yogurt, or sprinkle it over smoothie bowls or even ice cream! 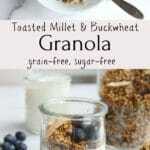 Who needs oats for granola? This nutritional powerhouse is made with millet and buckwheat, along with chia seeds, pumpkin seeds, nut butter and coconut oil. It’s packed with protein and fiber and has a delicious nutty-sweet flavor. 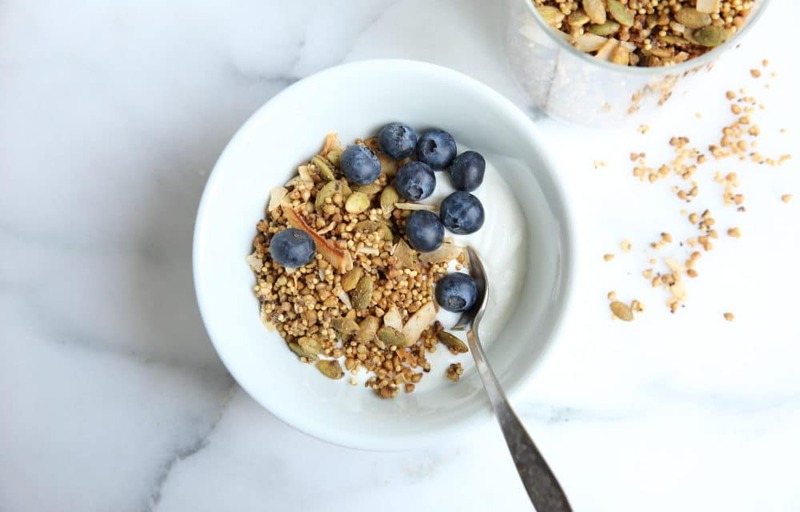 Serve the granola it on its own with yogurt or milk, or try sprinkling it over smoothie bowls or even on salads. The type of nut butter you use will affect the flavor, so go with what you like (I usually opt for almond butter or sunflower seed butter, but it’s up to you!). You can either sweeten the granola with honey or make it sugar free by using stevia instead. Different brands of stevia vary in their intensity, so be sure to taste as you go (I’ve also found that the more you eat stevia the more you become accustomed to its taste; if you’re trying it for the first time start small). 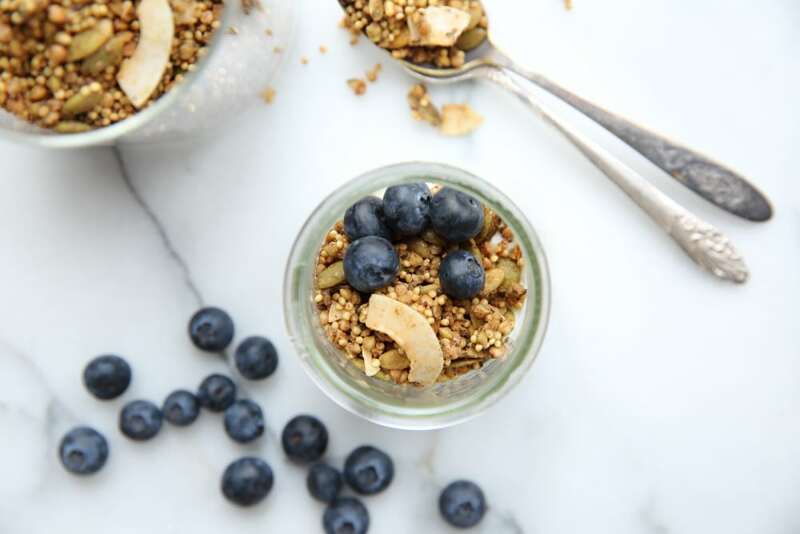 Be sure to rinse the millet and buckwheat before combining them with the other ingredients—the moisture will help the granola to clump slightly. 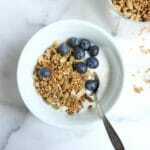 Sometimes I add chopped dark chocolate to this granola after it cools! Preheat the oven to 325˚F. Line a baking sheet with parchment paper. Rinse the buckwheat and millet in a strainer with cold water and drain well. Transfer the grains to a large bowl, and add the pumpkin seeds, coconut flakes, chia seeds, cinnamon and salt. In a small saucepan, combine the sunflower seed or almond butter, coconut oil, vanilla and honey or stevia. Stir over medium heat until melted and smooth. Pour the wet mixture over the dry ingredients; stir until everything is well coated (if using stevia, give it a taste and add more if desired). Transfer the granola to the prepared baking sheet. Spread and pat the granola into a 12x9-in rectangle, about ½ inch thick. Bake 15 minutes. Gently stir, using a spatula to flip the granola over (try to keep some chunks intact). Bake an additional 14-15 minutes, or until lightly browned around the edges (if using honey, check at 14 minutes). Give it another gentle stir, then bake 5 minutes longer, or until the granola feels slightly dry (it will continue to dry out as it cools). Remove the pan from the oven, and cool the granola completely. Do Ahead: The granola can be stored in an airtight container at room temperature for about 2 weeks.